Today we celebrate a holiday seldom marked these days. What with the Republican Convention poised to start whenever the threatening storm Isaac eases up, and Florida residents leaving their homes to escape the hurricane, there has been little notice of Women’s Equality Day. Why a holiday in August so close to Labor Day? Because it marks the anniversary of the day in 1920 when the 19th Amendment, giving women the vote, was signed into law. That date is important. It has revolutionized the way women live and operate in our society. And the date might not be remembered at all except for the work of a woman born in 1920 a month before the amendment was proclaimed. Her name was Bella Abzug. 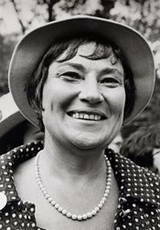 For women living in New York and much of the rest of the country, Bella Abzug became a familiar figure during the 1970s when she was a Congresswoman from New York City. One of her many achievements was being the first Jewish woman elected to Congress. Bella Abzug was a figure made for the age of television. She had a distinctive look—she wore a broad-brimmed hat whenever she appeared in public—and a distinctive voice that was hard to ignore. The hats were the result of her becoming a lawyer in the days when few women practiced law. She started wearing a hat in the office so people would not assume she was a secretary. It was a trademark and gave her more recognition than most other members of Congress. Abzug was a labor lawyer who fought for the rights of unions, workers, and members of minority groups. In Congress she sponsored a bill for immediate withdrawal of troops from Vietnam War. It didn’t pass. She also called unsuccessfully for universal health care. Her crusades were often unsuccessful, but she cared deeply about politics and would not relinquish her insistence on fighting for what she thought was right even though she lost. She was a fighter and she raised issues that were unpopular in her day but have since been accepted. So now on this quiet weekend before Labor Day let’s remember Bella Abzug and the other courageous women who fought so hard to give women the freedom to vote and to influence political life. We have all benefitted from their work.